The Nili Fossae region of Mars is one of the largest exposures of clay minerals discovered. In this HiRISE false-color image, dark blue regions are volcanic minerals. Light-toned areas are clay-rich material and may contain water and organic materials--a possible place where life can be supported. Scientists are getting a new view of Mars thanks to color images and a color movie of the Martian landscape created by painstakingly combining images snapped through different color filters. 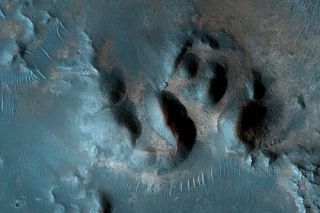 The images, taken by the High Resolution Imaging Science Experiment, or HiRISE, on NASA's Mars Reconnaissance Orbiter and released today, will help scientists determine the landing site for a future Martian explorer, NASA's Mars Science Laboratory, set to land on the red planet in 2010. The HiRISE camera carries 10 red filter detectors, two in blue-green, and 10 for infrared wavelengths. In what was described as a "Herculean effort," the HiRISE team members developed computer software to automatically process images from the different filters into color images. "The technical hurdle has been that the sets of different color detectors are staggered within the camera focal plane array, and the spacecraft isn't perfectly steady as it operates in space," HiRISE operations manager Eric Eliason of the University of Arizona. The end result of all this work is 143 detailed, full-color images as well as a 41 second movie clip that scrolls over Mars' Nili Fossae region. All of the images were taken over or near 30 proposed landing sites for the Mars Science Laboratory. The images were created in false colors to maximize color differences, so the landscapes they depict would look different to a human standing on Mars. Color is a boon to geologists who have been trying to discriminate different surface materials and their relation to the Martian topography, McEwen said. They also help geologists match layers in the Martian terrain. "Color data are proving very useful in interpreting geologic processes and history on Mars," McEwen said. "The images we're releasing today include views of some of the most exciting and compositionally diverse areas on the planet. They are really interesting."